Jim Corbett National Park is an eminent national park of India. It is positioned in the beautiful state of Uttarakhand. The park has the honor of being the first national park in Asia. It stretches across 512 square kilometers of marshy and mountainous expanses. Two gorgeous rivers Ramganga and Kosi offer a new stature to Corbett’s exquisiteness. Corbett national park is a second name of escapade. 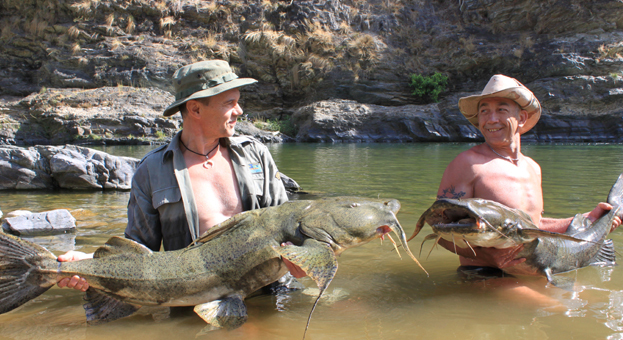 An adventure freak can enjoy here many hair rousing activities like safaris, bridge slithering, fishing and angling and river rafting. This protected area is the dream destination of all adventure hunters. One can say that Corbett is the superlative mishmash of loveliness, adventure, wildlife and fun. What are the adventure activities available in Corbett? Adventure holidays take the tourists away from the dull routine. Undertaking adventure activity is the perfect way to satiate the adrenaline rush and rejuvenate the soul. Corbett offers an assorted range of stimulating adventure activities. Here is the list of some of the major adventure activities that one can undertake in the park. Corbett National Park is no less than an Eden for those who love fishing and angling. Ramganga and Kosi rivers offer an ample of opportunities for this recreational adventure. In Corbett, a freak of fishing can easily find Goonch, Silver and black Mahseer. Although, fishing is not permitted inside the park premises, one can enjoy this game in the nearby areas of the park. Best time for fishing in the areas around Corbett is from March to early June and then from end of September to late October. This time may vary due to rain. River rafting in Jim Corbett is done near some of the most exquisite topographies offered by the Garhwal Himalayas. Clean beaches, rock-studded rapids, convergences of the rivers, fascinating ravines and few of the most admired temple towns, make the rafting expedition worth memorable. Rafting is an adventure for almost everyone. With skilled guidance and modern equipments, rafting is easy to learn and is secure as well. It takes you to the wild journey of your own. River rafting in and around Corbett is a wonderful adventure activity that can be done in the monsoon season only. An adventurer can undertake rafting activity in the Kosi River. There are grade I and II rapids on the rafting route in Corbett. There are some tips and guidelines that an adventurer must take care of, before going on rafting. To carry personal stuffs (mobile, wallets, etc), one should take a dry bag. Carry first-aid items as well as sunglasses, sunscreen, etc to keep yourself safe from the harsh sunrays. Avoid wearing tight cloths, and wear swimsuits and lighter clothes instead. Bridge slithering is an enthralling adventure in which an adventurer has to slide from a bridge into the river. Slithering is done with the help of a rope. A harness secures the adventurer while sliding down. Bridge Slithering is a preferred adventure activity in Corbett. It is highly popular in the Kosi River. The adventurer jumps from the Jhula Bridge, into the Kosi River. A kayak or the supporting staff waits below the bridge for the adventurer. It is advisable to carry some extra clothes if someone is going to perform this adventure. Rock climbing is an adventure sport where the adventurers climb up and cross a rock formation. The adventure freaks undertake rock climbing to reach the uppermost point the rock without falling down. 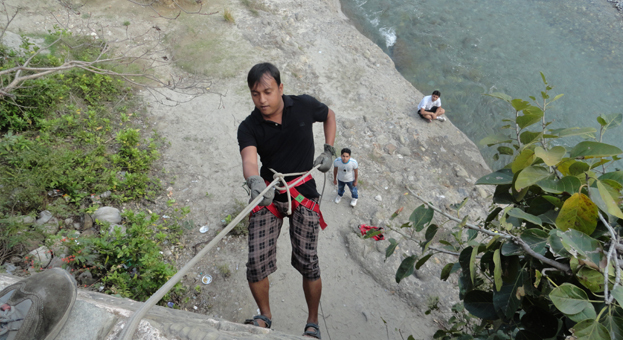 When a tourist is in Corbett, apart from animal and bird watching, he can try this exhilarating sport of rock climbing. Despite the fact that rock climbing is a treacherous activity and requires patience and physical strength, it creates lots of stimulation, and adrenaline rush. Corbett draws a good number of sport aficionados, especially for rock climbing. The pebbly cliffs of the Himalayas offer an exhilarating challenge to the adventure freaks and the rock climbing freaks. The scenic landscape of Himalayas sets it as a dreamland for all climbers. Autumn and summers are the best times for rock climbing in Jim Corbett National Park. This region also has a number of Rock Climbing clubs that offer training and assistance. Mountain biking is an adventure activity in which an adventurer rides the bicycle off road, generally in the rough topographies. A specially designed bicycle is used for mountain biking. Mountain biking trips target to explore the Corbett panorama through the tour based on adventure amid nature. The feather on the hat is added by the introduction of mountain biking along with night camps, short treks and wildlife based modules to offer a deep exposure to the assorted parts of Corbett landscape. The adventurers ride bicycles along mild routes through rural areas and the countryside with a few slightly challenging routes in the woodland, camp along forestry streams, or close to old temples, discovers flora and fauna in the thick wilds of the Corbett area. River crossing refers to crossing the river while hanging on a rope tied from one end to the other of the river. It is a great fun crossing a river on a rope. Jim Corbett National Park, having rivers like Ramganga and Kosi in close proximity, provides ample options to the adventurers for river rafting and traversing. The task of crossing the river, reaching the other side of the river safe and sound across makes it a startling team experience. Rappelling is a method of controlled descent from a clip with the help of a rope. This activity is counted among the prominent adventure activities in Jim Corbett National Park. At the time when a tourist want to descent, there are principally two alternatives- he can either walk or hike down, or he can rappel. However, when the terrain turns is too steep, rappelling is the quicker, easier and safer way out. The environs of this place make it simply incredible and nothing could be a better way to explore the lushness of this place than by going on a nature trek. This adventure recreation allows a delightful experience in the middle of the nature’s exquisiteness, where one can meander at his own pace and stop wherever he finds something interesting. 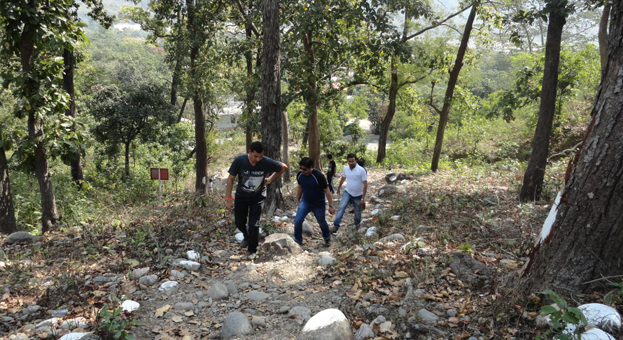 An adventurer coming on a trip to Jim Corbett should make certain that he includes nature walk in his itinerary. There are numerous treks that are categorized according to their difficulty levels. Nature trek is allowed only at a small number of regions and is restricted at the majority of the regions of the Corbett. It is conducted by skilled and knowledgeable naturalists, who disclose the charms and astonishments. Burma Bridge offers an absolutely different sort of adventure to the adventure enthusiasts. One can take an invigorating walk across the bridge while putting on a safety harness. The structure of Burma Bridge constitutes two parallel ropes strung from the poles at a height of 25 feet. Two groups of participants have to climb the structure by walking on one rope and at the same time holding the other rope for support. This is an exciting activity for individuals wanting to attempt something different. Corbett is famed for its incredible safaris, here are the three stirring safaris offered in Corbett. It is the most breathtaking, natural and imposing safari in Corbett. If an adventurer wants a close and invigorating look of animals in their natural environments then elephant safari is the best choice. 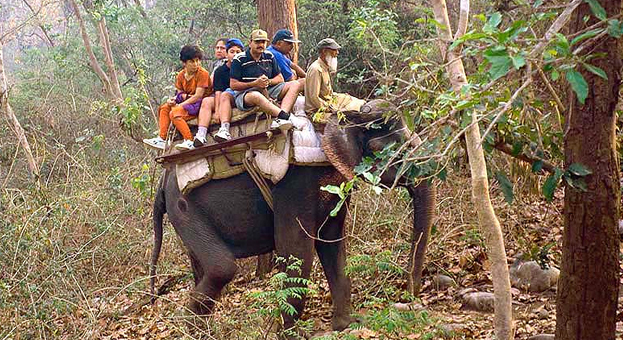 By undertaking Corbett Elephant Safari, a tourist can explore each part of the park without any difficulty, particularly the deep thick forest, where other safaris cannot move. One can book one’s Elephant safari from Bijrani & Dhikala. This safari is a tremendous concoction of excitement with family, ecstasy and protection. A canter with a capacity of 16 people is the vehicle that can offer tourists a safe and adrenaline-charged exploration of Corbett. A tourist can hire a canter safari from Ramnagar. 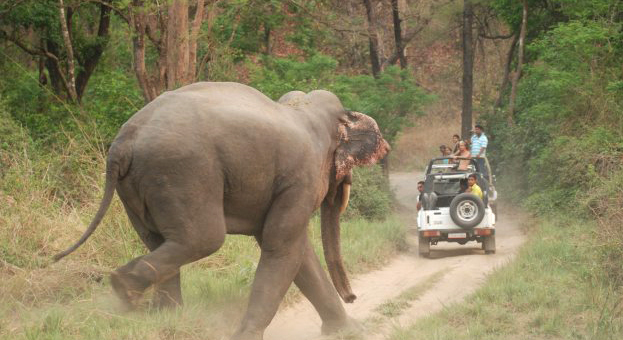 Jeep Safari is a popular, which offers a new aspect of Corbett’s flora and fauna. If a tourist is a speed lover and wants same outstanding and rare photos of wild life of the park, then jeep safari is finest option. Jeep safari is finest safari for tiger trekking. A tourist can hire jeep safari from Ramnagar. Corbett is the ecstasy for all-inclusive retreat, which can revivify the body as well as mind, and give pleasure to the tourists in an inimitable fashion. So, do not waste time and book your tour to enjoy the adventures amid the spellbinding beauty of Corbett.